From a far, Invictus looked like a movie with a lot of potential. On the one had you have Clint Eastwood in the directors chair and on the other you have Morgan Freeman in a role he was born to play, Nelson Mandella. Unfortunately, Invictus wasn’t able to follow through as well as I hoped. Invictus told the uplifting tale of a rugby team bent on winning the world cup in South Africa in order to bring the country together. It’s a very inspirational tale, but it just feels as though its all been done before and much better for that matter. Clint Eastwood is one of my favorite directors, but with this movie it really just felt like he was trying to make a good-feeling best picture contender. He’s just done so much better with masterpieces like Mystic River and Unforgiven under his belt. It was a little disappointing. To shed some light on this movie, I must say I absolutely loved Morgan Freeman. He was fantastic, a performance certainly worthy of the nomination it will get. As I said before, he was born to play this role and I’m actually surprised he hadn’t played Mandella sooner. He was phenomenal. Matt Damon on the other, I wasn’t a huge fan of in this film. I’ve never been a huge Damon fan, but he has surprised me in the past. This film was one of those cases. Overall, with Eastwood’s directing and Freeman’s performance, Invictus made for a decent movie, while it could’ve been great. After watching Invictus, I came to realize I would’ve much rather seen a movie centered around Nelson Mandella’s life and election. I believe that would’ve made for a much better movie. 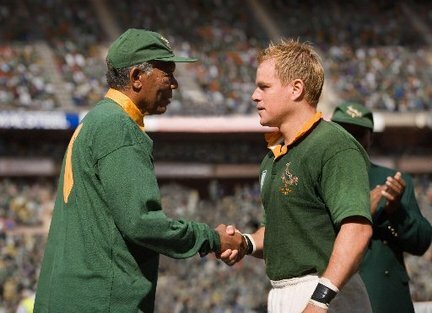 This entry was posted in All, Movie Reviews and tagged Clint Eastwood, Invictus, Invictus Movie, Invictus Movie Review, Invictus Review, Matt Damon, morgan freeman, Nelson Mandella, Rugby, South Africa. Bookmark the permalink.